Hurray! Hurray! The NEW 2011-2012 Stampin' Up! 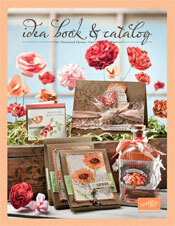 Idea Book & Catalog is available TODAY! If you're coming to my new catalog open house tomorrow, you can pick yours up then. If you can't make it and you would like a copy, please contact me to arrange to get your own catalog. There are so many things that I love about this new catalog - the fresh, new colors, gorgeous stamp sets, new accessories (including adorable polka dot brads, among other things)! I know you will love it too! AND - Stampin' Up! has a great $99 starter kit offer (contains over $180 worth of product and supplies)! It's always more fun to stamp with friends! The limited-time $99 Starter Kit is the perfect choice for the lover of Stampin' Up! products who wants to get the products they love at a 20 percent discount. Whether you want to purchase your supplies at a discount or build a part-time or full-time business, you can't beat this offer! This is a great time to join Stampin' Up! and my team! Contains over $180 in products and business supplies--including new products from the 2011-2012 Idea Book & Catalog! All items below are recommended, but a new demonstrator can substitute a similar item of equal or lesser value. *New to the 2011-2012 Idea Book & Catalog! The business supplies in these promotional mini kits will be the same business supplies that are in existing starter kits. If you have ever thought about being a part of the Stampin' Up! family, you couldn't find a better time than now! Contact me to find out more information - we can get you signed up and started today if you'd like, or we can meet for coffee (or maybe iced tea? ), or chat on the phone! I know you would really enjoy being a part of the Chalk-a-holics group, and we would LOVE to have you join us! Love being part of the Chalk-a-Holics Family!